How to do you choose the best treadmill? This is a question we constantly hear, because of that we have created this post to give you the top treadmill reviews for 2017. 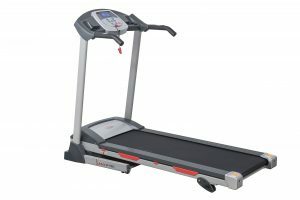 This guide is designed to give you all the information you need to find the perfect treadmill for your particular needs. A healthy lifestyle is not only good to improve energy levels but also can improve longevity, cognition and insulin resistance. Having a treadmill at home may help you avoid procrastinating about exercise and is way cheaper than a gym subscription. . When we compare a home treadmill to the gym, an average yearly subscription to a gym is around $800 so If you buy a treadmill for $1500 you will get you money back in less than two years, the upside is that after that you can keep working out for free for years to come. Today’s home treadmills are loaded with all the features needed to have a safe and fulfilling workout routine. 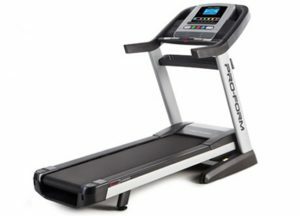 The technology has improved to such an extent, that many of these treadmills now offer users the opportunity to insert ipods and even connect their television systems to the screen, making your workout more fun and convenient. Special Features: Weight limit of up to 265 lbs, Easy to fold down and store away, multifunctional LED display, 600W power motor. Fitness and weight loss all comes down to basics and that is exactly what the Confidence Power Motorized Electric Treadmill provides. The 600-watt motor will keep on working for years to help you shed weight and will only need to be serviced once a year. 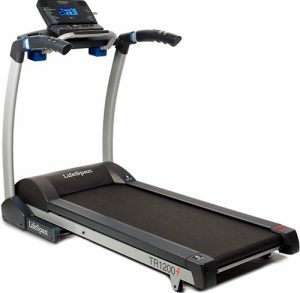 The easy to fold down feature will make this treadmill perfect for a home treadmill desk, giving you the opportunity to complete work as well as shed some pounds. The multifunctionality is one of the biggest features and this treadmill can easily be moved to any space of the house and once you are done, you could simply fold it and store it away. The weight limit on this treadmill is quite significant, given the small size and lightweight frame. The treadmill will be able to carry individuals weighing up to 265 pounds, If you are above that weight you should check one of the more expensive options presented in this post. The multifunctional LED screen will easily help you maintain track of your progress in real time. Special features: 2.2 HP peak DC motor, easy folding mechanism, handrail controls to allow for complete control over workout and speed, 9 built-in user panels and three variations of incline. 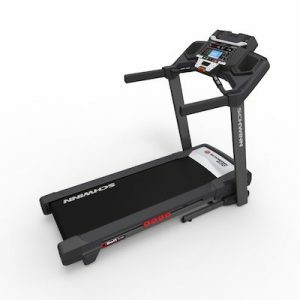 Sunny Health & Fitness SF-T7603 Electric Treadmill is one of the more technologically advanced treadmill that can be used by people at any fitness level l. The treadmill is extremely easy to fold and no tools are needed to get the treadmill ready to use. The 2.2 HP peak DC motor will be a great driving force to keep you shedding those pounds year after year. This power not only makes this treadmill useful to joggers, but also to sprinters and high-intensity interval trainers. The Sunny Health & Fitness, boast an impressive LED display, set with 9 built-in workout programs for beginners and professionals alike. 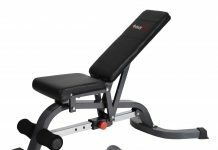 The added three step incline system will be great for resistance training and should really make this a great buy for anyone looking to get into shape. The handrails can easily fold down, but by using the handrails, you will have added comfort on your workout and the ability to maintain your current form while switching through the different speeds. You will also be able to easily monitor your progress and keep your heart rate at a safe, but efficient rate. Overall the Sunny Health & Fitness treadmill is a great buy for beginners entering the fitness industry or just casual users looking for something to relieve some stress. The multi-functionality will make this treadmill perfect for the home or office and it can easily be folded up and moved in order to save space. Maximum weight limit:Before buying a treadmill, it would be extremely important to check if the treadmill has the capability of sustaining your body weight. Price:The cheaper machines will still be perfect if you are in the lower income section, but having a more expensive treadmill will surely be an investment and you will save the extra money on the long-haul. Special features: Digitally adjust incline up to 10%, 20 built-in workouts created by a certified personal trainer, easy to plug in iPod or mp3 player to the console sound system, 2.6 CHP drive system. 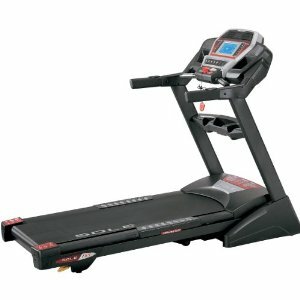 If you are looking to get into the habit of running fast, then the NordicTrack T 6.5 S treadmill will be perfect for you. With a 2.6 CHP drive system, the treadmill can easily achieve your top running speed and will push you to your limits to not only lose pounds, but also achieve help you achieve your fitness goals. The 5” display system will make it easy to track your progress and even add a little incline for increased resistance. With 20 built-in programs all designed by a top personal trainer, you will have plenty of variety to keep your workouts interesting. All of these programs have been designed with results in mind and you are guaranteed to achieve your goals. For added motivation, the NordicTrack company has added a slot for you to easily install your iPod and mp3 player, thus letting you listen to your very own motivational music and even letting you save some money on expensive headphones. The Flexselect cushioning system has been proven to withstand a lot of punishment and will help reduce joint pain in the knees and ankles, this will give you the opportunity to enjoy a longer more useful workout. Overall this treadmill has been proven to help people with comfort and injuries and can easily be used as a training tool for recovering from injuries. The treadmill will work perfectly for both professionals and beginners alike. As a multi-functional yet technologically advanced treadmill, the Horizon Fitness T101-04 Treadmill will provide you with the opportunity to exercise inside the comfort of your home. The side rails can easily fold down to provide comfort and keep you focused on your work. A 2.25 heavy duty CHP will let you easily achieve the top speed of 10 miles per hour while still providing a smooth and quiet sound from the motor. The 30 professionally designed programs will allow you to quickly choose the perfect fit for your fitness level and the 300-pound weight limit makes it accessible to a wide range of users. If you are looking for a challenge, the Horizon fitness treadmill will allow you to set the incline to a maximum of 10%, thus allowing you to easily burn off more calories in a shorter amount of time. The variable response cushion in the running pad will allow for a smooth transition through every step and the added benefit of no joint pain. 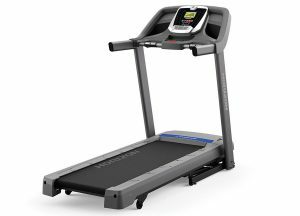 Overall this treadmill will provide quality and durability and you can easily input your mp3 player to have some added motivational music on the high-quality Sonic sound system. Special Features: Soft drop folding system, 3 x 5-inch high-resolution blue backlit LCD monitor, 2.75 CHP motor, soft trek four cell cushioning, large 2.5 crowned rollers for a smooth and quiet workout. The Schwinn 830 Treadmill is loaded with a wide variety of programs; these programs include three quick goals, six train, and five weight control programs to give you a large variety to choose from. The added custom program will make it easy to have your very own self-designed program that fits your needs and exercise capabilities. Schwinn has added an easy to use soft drop folding system. This will allow for a smooth transition after use and the added benefit of having space freed up. This will be an added advantage for users that do not own a huge apartment or home. The soft trek 4 cell cushioning technology will allow for a smooth transition throughout every step; this may be beneficial to user suffering from joint pain or in the process of rehabilitation. The soft trek cell 4 cushion will also mimic the feel of the road, thus giving you the opportunity use this machine for training as well. Finally, the LCD monitor is fitted with a mobile device charging port and the Schwinn Connect System will allow you to connect all your results directly to the hugely mobile app. This will make tracking of your stats much easier, and you will know exactly how to reach those goals. 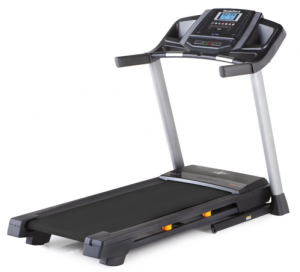 Overall this treadmill is perfect for sports athletes and casual users alike. The high-quality technology on this treadmill will also be hugely beneficial for people not yet acquainted with the standard fitness tracking apps. Special features: 2.5 HP folding treadmill, Multicolored LCD display, several programs for healthy living and weight loss, all steel frame to simulate real world conditions, 6 shock absorbers to withstand high impact. The ultimate running simulator for marathon runners and sprinters. The LifeSpan TR1200i Folding treadmill will give professional runners the opportunity to train at home even when the conditions outside are not ideal. The treadmill can easily fold up and be stored away without taking too much space and the multicolored LCD display will make it easy to keep track of your results. The running pad is created with 6 high-quality shock absorbers to withstand high impact and allow for and allow for a smooth transition from step to step. The running pad is also designed to emulate the real world conditions of running on the road. Several programs are included to the onboard system and these range from healthy living to achieving high levels of fitness and burning off those excess calories. The motor is designed to run smoothly and without any vibrations and unnecessary sounds. The LifeSpan TR1200-DT3 Under Desk treadmill is perfectly designed to be used with a standing desk. With no hand railings that need to be adjusted, this treadmill will perfectly fit under any desk out of the box allowing you to stay active and achieve your business goals at the same time. The treadmill comes with an already included portable console to make life easier if you are tracking your distance and even calories burned. 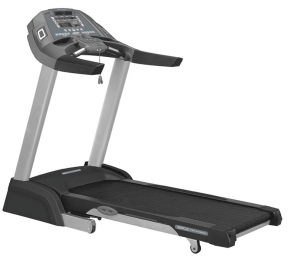 The added benefit of this console is that you will be able to easily adjust the speed and incline of this treadmill to ensure that you have the perfect fit for your abilities. 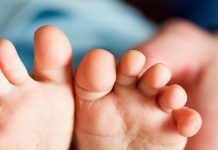 The onboard Intelistep technology will track every step that is taken and will even adjust to the pauses you need to take to catch your breath. This feature also allows for easy transitioning from step to step, thus protecting your joints from any strain. Overall this treadmill is made for the hard working person that cannot find the time to workout. 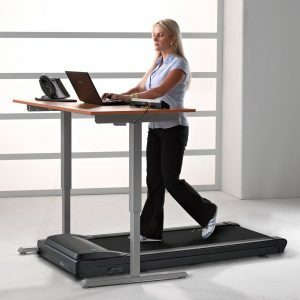 The multifunctionality of this treadmill is great, and it can easily be transported between work and home. Special features: EZ fold technology uses hydraulic shock to assist, 15 incline levels and a maximum speed of 12 MPH, 6” blue backlit LCD screen to display stats. Versatility and multifunctionality has never been easier that with the LifeSpan TR3000i Folding Treadmill. 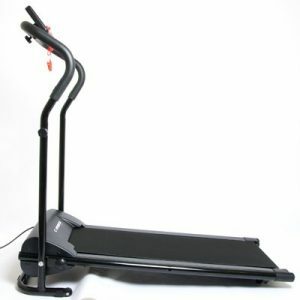 This easy to move and fold treadmill is made for the office and home and can easily be folded to save space. The hydraulic shock will assist the folding process and 1 person can easily manage to do this. The treadmill features a 2.75 CHP motor and a 800-pound maximum incline lift motor. This will give you the benefit of easily tapping into the 15 levels of incline available and improving your workout results. The 6” blue backlit display will make it easy to track all your stats and at the same time adjust your workout between the multiple programs it has to offer. 8 compression shocks will also help to make every step as smooth as possible and protect your joint from possible injury. Overall this treadmill is the perfect fit for anyone who likes to travel. The easy to fold up frame is quite light and will give you the opportunity to move it from place to place. 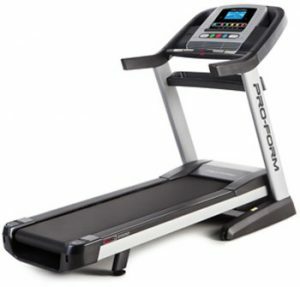 Built for the Apple users, the ProForm Pro 2000 Treadmill is a great addition to the home of any fitness enthusiast. The 3.5 mach Z commercial pro motor is designed for prolonged use and gives users the ultimate opportunity to reach the top speed of 12 MPH. Apple fans will have a blast with this treadmill and can easily input their iFit live app into the CPU, this will not only help you keep track of your work out, but also add new possibilities to the treadmill. The wide variety of programming options will allow you to easily choose the right program for your fit, these excellent programs range from body weight control weight loss and the folding feature is sure to save you the extra space needed in your home. The highly powerful 3.0 CHP motor will let you achieve high speeds and makes this the perfect treadmill for sports athletes and casual users alike. This speed system can easily be controlled by the one touch speed system featured on the hand rails. Overall this treadmill is made with quality in mind and will provide users the perfect mixture of fun and fitness capabilities. You will keep track of your intended goals with the stats tracker and comfort will definitely be found with the OrthoFlex shock system. Seriously! no cons on this one! The Sole F85 Treadmill is the leader in commercial use and multi-functionality, this treadmill come fully equipped with a 9” LCD workout display to help you track all the progress you have been making. 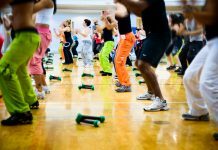 The added benefit of 6 standard workout programs will allow beginners to start off like a professional and have a high intensity, fat burning workout. For the professional users, this treadmill offers the opportunity to add two custom programs as well as already added heart rate programs to monitor your fat burning progress at a healthy rate. The 4.0 CHP DC motor type is top of the line and comes with a life time guarantee for any problems or manufacturer defects, making this a once of buy for any fitness enthusiast. Finally, you will have the ability to play your favorite song as you work out, the treadmill comes fully equipped with a mp3 compatible sound system that will allow you to easily insert your mp3 player or mobile phone and have some motivational music. It is quite heavy, will be hard to move in case of a change of city. Throughout the US, the treadmill is becoming a standard household feature and it is extremely important to have the perfect fit for your home and your needs, For the people that prefer to have the basic and standard features, we recommend the The LifeSpan TR1200i Folding treadmill. This treadmill will allow you to easily complete your daily routine and will be easy to fold up and move at the same time. 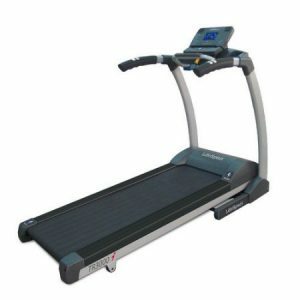 For the more advanced and professional fitness enthusiasts, we recommend the Sole F85 Treadmill as the best treadmill. This treadmill has all the features and requirements needed for a professional athlete, but even for beginners the technology will make the learning curve easier and much more faster. 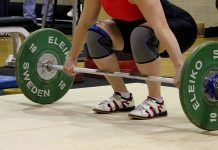 Previous articleTraining At Home or Training at The Gym?